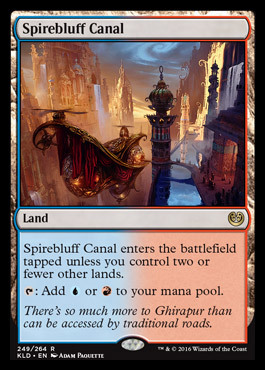 Hello All and sorry for it being quite a while since I last posted, but with life finally making some more sense I’ve come back at a great time for going over some of the most recent spoilers for Kaladesh. So far the spoilers for Kaladesh have been pretty interesting, from the new Fast lands and vehicles/ artifact theme to the new Planeswalkers, and of course Energy counters! 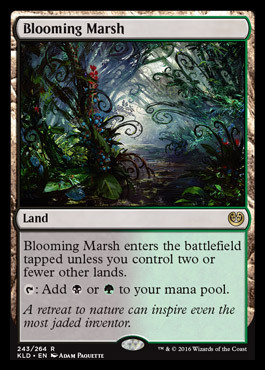 The enemy Fast lands I feel are going to be great for standard in that they give you your early game mana fixing untapped and should work out well with the other lands playable in standard. 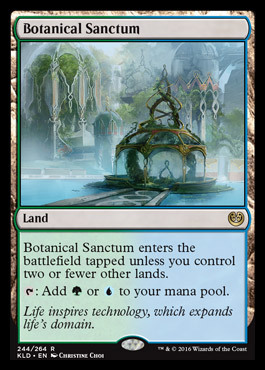 Outside of that I am not sure how much play the new Fast lands will see, as in Modern we have fetches and shock lands, it is really hard to top those kinds of lands. As for these wonderful new vehicles I think my verdict is still out on this one, as the idea seems interesting and could be powerful I’m just not completely sure how powerful. In a deck running the new Vehicle artifacts one is going to have to be careful as too how many they are running as you need creatures to activate them as well as other spells to interact with. 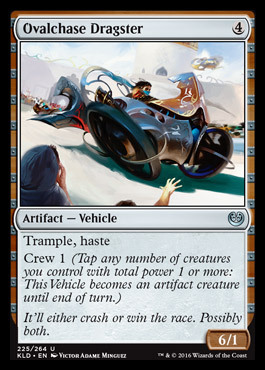 My initial feelings towards the vehicles is that they will end up being an aggressive style deck especially with some of the other cards already spoiled. Another set of artifacts I like from this set are the Gearhulks, Verdurous Gearhulk seems fairly impressive for 5 cmc a potential 8/8 Trampler or making your team of creatures sudo anthemed to making your evasive flyer large enough to become a major threat. Then we have one that will very much depend on where the format goes, Cataclysmic Gearhulk with its sweeper like effect could be a mid-range / control decks best friend, but will definitely depend on how the format evolves and if control is still viable. 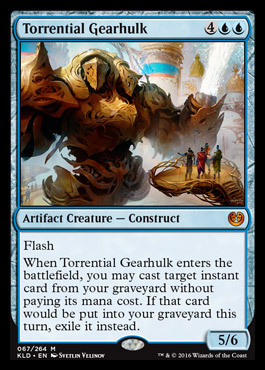 My favorite of the spoiled Gearhulks so far though has to be Torrential Gearhulk, a 5/6 flash that casts an instant from your graveyard for free is pretty intense, paired with murder or other removal spells could be a complete blow out. Torrential Gearhulk in standard feels pretty close to a Snapcaster Mage reprint except bigger, I fully expect this guy to see a lot of play. 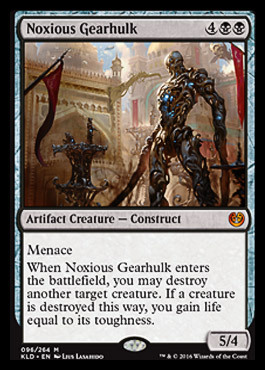 The black Gearhulk, Noxious Gearhulk seems like another completely awesome card and does exactly what you want a card like this to do, kill a creature and gain you life leaving you with an evasive win condition. Noxious Gearhulk feels like another sweet addition to mid range/ control decks and I am twitching to brew a mono black list but we shall half to see. I feel that all of the Gearhulks spoiled so far will definitely see play in some form or another as they are all powerful cards it will just depend on how many of each one fits into decks in the new standard. Another card worth mentioning that has caught my eye is definitely Panharmonican, which doubles your enter the battlefield triggers of artifact and creatures, which basically turns Demon of Dark Schemes from infest to Languish. 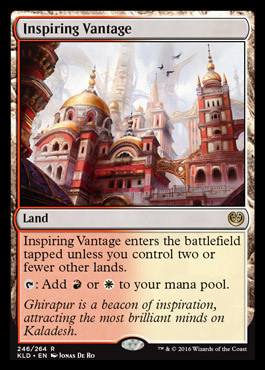 I am interested to see what this card can do, it’s only downside is that it might be too costly for its effects to matter, as if this is your play on turn 4 you will have to have something fairly significant to cast on turn 5 to be happy about it. 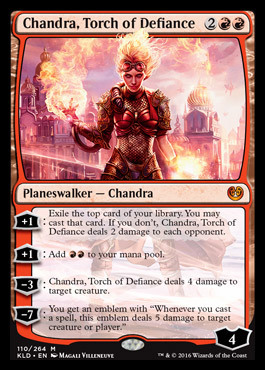 Chandra, Torch of Defiance on the other hand feels very very powerful to me as all of her abilities are great and you really can’t ask for more out of a red planeswalker. I feel like this card has enormous potential as it has built in card advantage of the red variety but with the built in effect of shocking your opponent instead if you wish. Her other plus ability of giving you RR also seems really good ramping or being able to cast an additional spell the turn after you cast her in order to protect her, if you remember the good old days of Garruk Wildspeaker which is what this ability reminds me of ended up being a great card. 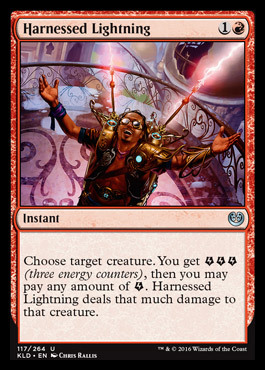 Now the -3 to deal 4 damage to a creature seems expensive at first but at least she can kill almost any threat we are worried about and at 4 cmc that really isn’t terrible. Then her ultimate will definitely get there assuming you still have spells to cast. With all of that said I feel Chandra will definitely see play, in what capacity I’m not sure as she feels like she could fit into a bunch of different styles of decks, I will definitely be brewing over the next week or so with her in mind . Saheeli Rai another of the spoiled Planeswalkers is a little more difficult to say if she is good or not, her minus abilities feel like they could be broken but her plus ability feels very lackluster. 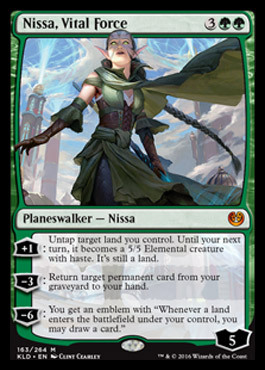 On another note Saheeli doesn’t protect her self either as she has no removal or permanent token generating abilities compaired to the 3 cmc walkers like Liliana, The last Hope or Nissa, Voice of Zendikar. Only time will tell if innovation can be done with this artificer Planeswalker. These new energy counters that a player can get from casting certain spells or certain abilities triggering seems very interesting and I like what I see so far. 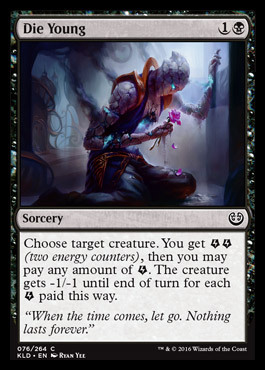 The couple of removal spells that give and use energy seem really good as they potentially stay relevant longer in a deck making use of the new energy counter mechanics. Over all we shall see how many enablers they print and how functional they will end up being. 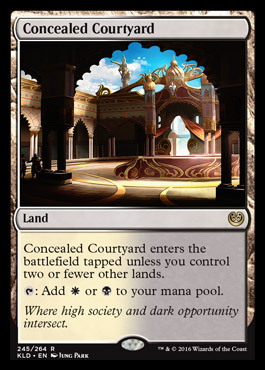 So far I am very excited about the up coming set and standard rotation and hope that we end up with various new paths to take for the next standard season.